Serbia’s Novak Djokovic serves to Switzerland’s Stanislas Wawrinka during their Group A singles match on day four of the ATP World Tour Finals in London on Wednesday. Three of the younger stars of men’s tennis broke through this season to reach the Top 10 in the rankings and qualify for the exclusive, lucrative, year-end tournament in London. But so far at the ATP World Tour Finals this week, several of the older men in the sport have been asserting their dominance, often winning in blowouts. Only the top eight healthy players in the world qualify for the tour finals. The injured No. 3, Rafael Nadal, skipped the tournament, so the other eight men in the top nine of the rankings entered. Then Thursday, No. 8 Milos Raonic withdrew with an injury, so David Ferrer stepped in to play Raonic’s last match. 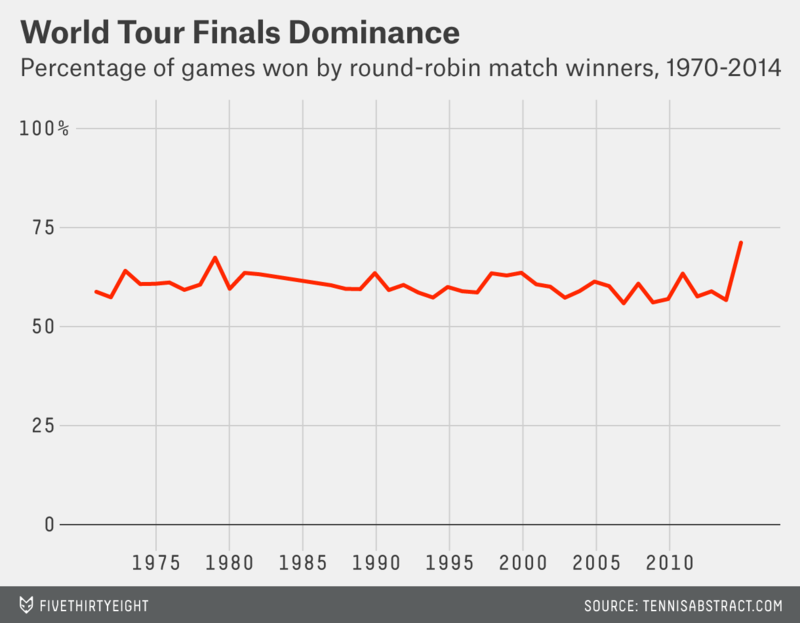 The tour finals provide a useful benchmark for the state of the sport. Since 1970, they’ve gathered the best players in the world around the end of the season to compete for big stakes in prize money and, since 1990, ranking points. The details have changed often: the host city, the format, the number of players and matches. But as far as the tumultuous history of pro tennis goes, the tour finals have been a relatively stable showpiece for top stars. This year, the state of the game appears to be one of change: 23-year-old Milos Raonic, 24-year-old Kei Nishikori and 26-year-old Marin Cilic — members of the sport’s “second line,” as Cilic called them at the U.S. Open — all broke through to reach their first tour finals. These days in tennis, even 26 is young. The young-ish debutantes also haven’t done much winning. Cilic won just six games in his two defeats. (“His debut in the World Tour Finals has gotten [the] best out of him in terms of his nerves,” Novak Djokovic said after beating Cilic, 6-1, 6-1.) Raonic suffered two straight-sets losses before withdrawing. Nishikori has won twice, including over the 32-year-old Ferrer on Thursday, but was routed by Roger Federer two days before. “The usual guys that everybody knows for a long time still enjoy the game and like to be out on center court, as well, accepting the challenge of the young guys,” Federer said after defeating Nishikori. He predicted his main rivals would continue troubling the upstarts for years to come. The tournament looks even grayer when factoring in who’s doing the winning. 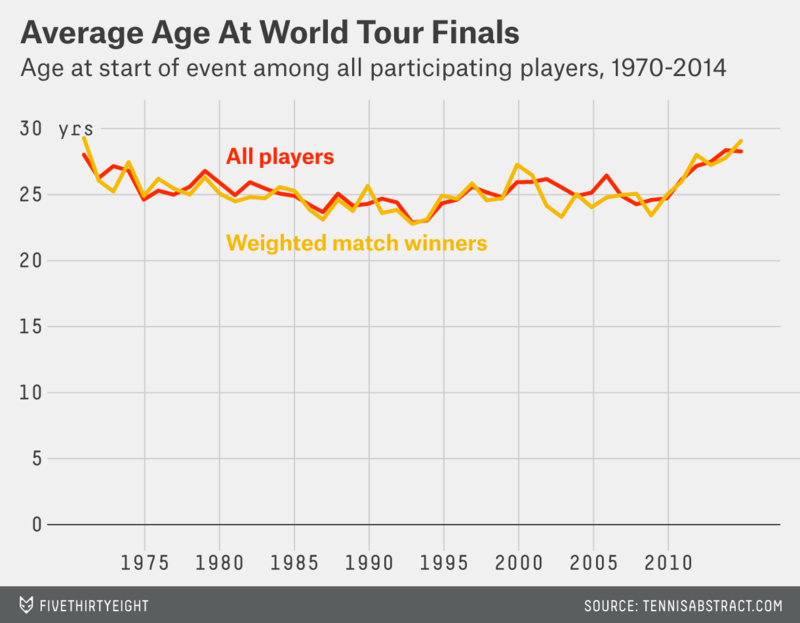 The average age of winners five-sixths of the way into the round-robin stage has been 29 years and 1 month, more than a year older than last year and older than at every other tour finals since the very first tournament, the elder-dominated event of 1970. Not only have the oldsters mostly held their ground, but they’ve done it in dominating fashion. Only one of the tournament’s 10 matches through Thursday even went to three sets: Nishikori’s defeat of Ferrer. 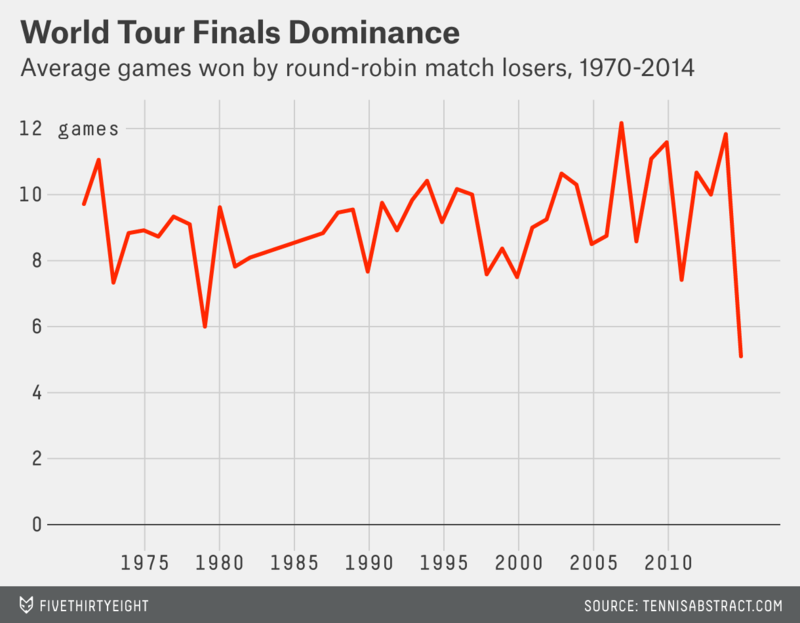 On average, the loser has won just 5.1 games, and the winner has won 71.1 percent of games. If those figures hold up, they’ll be the lowest and highest, respectively, in completed matches in the history of the round-robin portion of the event (which was skipped from 1983 to 1985).